An acid is a substance which releases H+ ions in water. A base is a substance that possesses hydrogen atoms and that releases OH+ ions in water. An acid is a substance that can lose its H+ ions to another type of chemical called a base. A base is a molecule that can accept H+ ions from another type of chemical called an acid. An acid is a susbstance that can accept an electron pair from another type of chemical. A base is a substance which can donate an electron pair to another type of chemical. Acids and bases differ in their capacity to give or receive protons. A strong acid is therefore defined as any acid which completely dissociates in water. Strong acids: sulphuric acid (H2SO4), hydrochloric acid (HCl), nitric acid (HNO3), hydrogen iodide (HI), perchloric acid (HClO4)and hydrobromic acid (HBr). Similarly, a strong base is one which reacts completely with water. Alkaline metal hydroxides and alkaline earth metals are said to be strong bases (NaOH, KOH, Ba(OH)2 etc.). The acid ionization reaction is further to the right the higher the Ka value (see right). Thus we can say that the greater an acid’s equilibrium constant compared to its ionisation the stronger it is. Note that the concentration of the water, which should appear as the denominator as it is high and constant, is included in the equilibrium constant. The ionisation constant for acetic acid is 8 x 10-5 which means that acetic acid is a weak acid. The ionisation constant for chloridric acid on the other hand is ≈ 107 and therefore HCL is a strong acid. The greater the Kb value of an alkaline the more likely it is to acquire a proton. Here, once again, the concentration of the water is included in the equilibrium constant Kb. 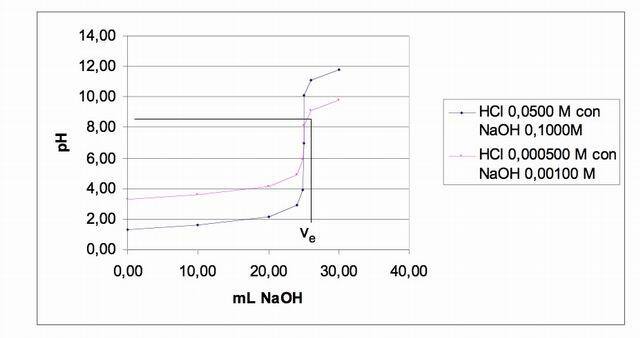 This is why, with strong acid strong base titration, the number of hydronium ions (H+) and oxonium ions is the same at the equivalence point and so the pH is neutral (pH = 7). In order to plot a strong acid – strong base titration curve we need three calculations corresponding to the different phases of the titration. It is useful to remember that for a titration curve we need to know the concentration of the acid and the base if they are both strong, and the equilibrium constant if the acid or base is weak and is being used as the titrand. The process of actually plotting the curve can be simplified using Excel which enables you to plot an x, y graph. In all cases the result is a sigmoid curve where the point of inflection is the equivalence point. 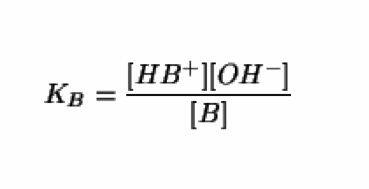 This equation is valid for any addition of titrant solution until equivalence point is reached. Obviously the concentration of hydronium ions and the pH can be arrived at through the inverse equation: [H3O+] = kw/[OH-]. Plot a titration curve by reacting 50.00 ml of 0.0500 M HCL with 0.1000M NaOH. The solution is 0.0500M initially so the pH = -log [H3O+] = -log 0.0500 = 1.30. Pre-equivalence point after adding 10.00 ml of NaOH (see right). 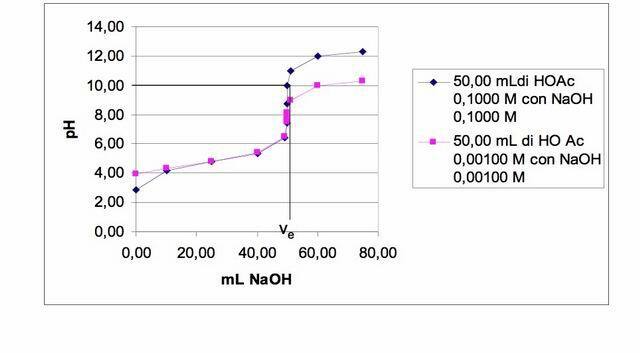 At the equivalence point HCl and NaOH will have reacted with the same number of equivalents and therefore the concentration of the hydronium ions and hydroxide ions found in the ionic product is the same (see right). 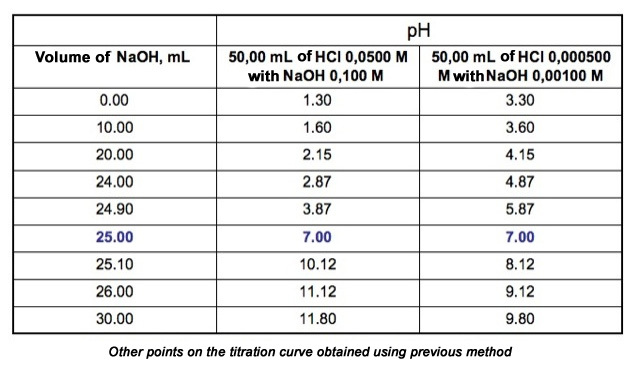 Further points on the titration curve are obtained as shown above. The calculations done so far produce the results shown in the table below. The data from the table above can be plotted on a graph to produce a titration curve. 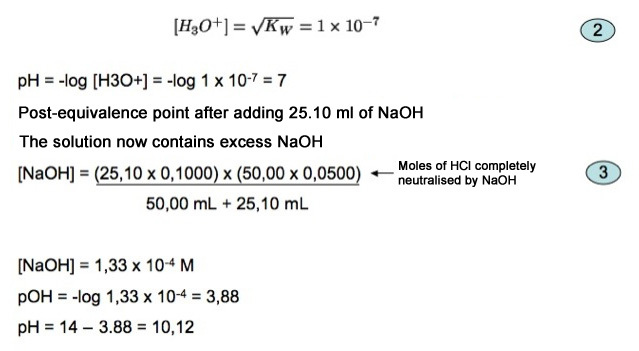 At the equivalence point (pH = 7) the volume of NaOH used is 25ml and therefore, inserting this figure into the equation C1 X V1 = C2 X V2 we can find out the exact concentration of the acid. Titration curves for strong bases can be plotted in the same way as those for strong acids. The solution is strongly alkaline when it is a long way from the equivalence point. At the equivalence point the solution is neutral, and it becomes acidic in the area beyond the equivalence point. An acid is defined as being more or less weak when the equilibrium of its reaction with water is not too far in the direction of the product. Weak acids: hydrofluoric acid (HF), acetic acid (CH3COOH), hydrogen cyanide (HCN). Where weak acids are concerned, we need to use the equilibrium constant as a reference (figure 1). A base is weak if it reacts with water in an equilibrium reaction. There is also a base constant for alkalines (figure 2). Whenever a weak acid is titrated using a strong base or a weak base is titrated using a strong acid, a buffer solution is formed from the acid-base conjugate pair. A typical buffer solution is one containing a fair concentration of weak acid and its conjugate base or a weak base and its conjugate acid. If we take the concentration of hydronium ions at equilibrium as our unknown, the equilibrium concentrations of the acid and its conjugate base are expressed as shown (see right). 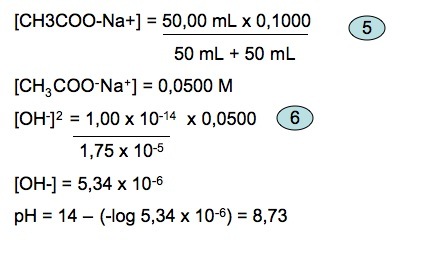 Here, once again, we need three types of calculation, each corresponding to a different phase of the titration. 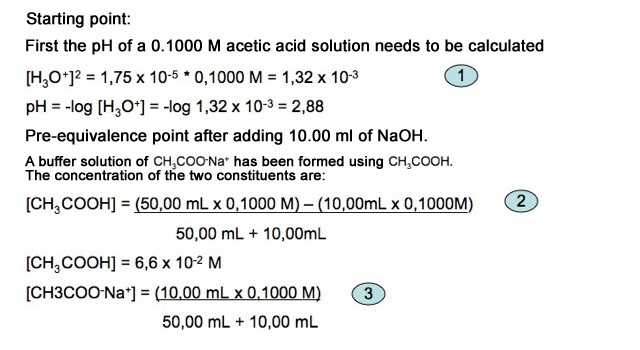 At the beginning the solution has only a weak acid or base and its pH is calculated based on the concentration of the solute and its dissociation constant. 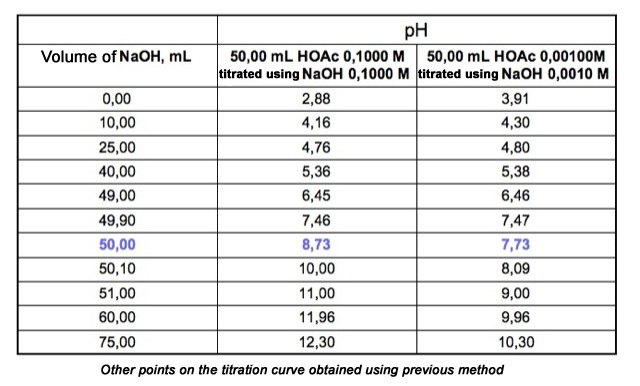 The pH before the equivalence point is calculated on the basis of the neutralisation reaction, assuming that it is complete: every addition of titrant solution uses up a small amount of acetic acid and forms a corresponding amount of acetate ions. The solution, therefore, contains a weak acid and its conjugate base in appreciable concentrations. At the equivalence point the solution contains only the conjugate form of the weak base or acid that it is titrating (the salt) and the pH is calculated from the concentration of this product. 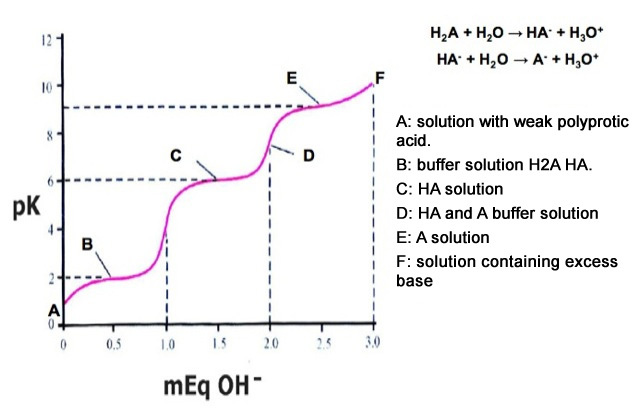 Beyond the equivalence point, excess of strong base or acid titrant suppresses the base or acid nature of the reaction product so that the pH is regulated by the concentration of the excess titrant. Plotting a titration curve for 50.00 ml of 0.1000 m acetic acid (Ka = 1,75 x 10-5) with 0.1000 M sodium hydroxide. At the equivalence point all the acetic acid has been transformed into sodium acetate. Imagine that Ve = 50.00 ml. After adding 50.10 ml of base, the NaOH and the acetate ions produce hydroxide ions. However, the acetate ions make very little difference because the excess of strong base prevents the formation of hydroxide from the water and acetate ions reaction. The data from the table above can be plotted on a graph to produce the titration curve. Strong base strong acid and strong acid weak base titrations can be dealt with in the same way. The titration curve starts off with a base pH which falls sharply at the equivalence point: the same concentrations as those used before produces an inverted sigmoid curve. A strong base titrated with a strong acid will have a neutral pH at the equivalence point. A weak base titrated with a strong acid will have an acid pH at the equivalence point, because the equilibrium constant of the neutralisation reaction is high but not high enough. According to Bronsted-Lowry, a polyprotic acid is a compound that can donate more than one proton (figure 1). According to Bronsted-Lowry, a polyprotic base is a compound that can accept more than one proton (figure 2). Compounds with two or more functional acid groups can produce multiple endpoints in a titration, because the functional groups have different acid strengths. The theoretical titration curves will be precise enough if the Ka1/Ka2 ratio is greater than 103. Plotting the curve for a multifunctional base is done in the same way as for the multifunctional acids we saw above.